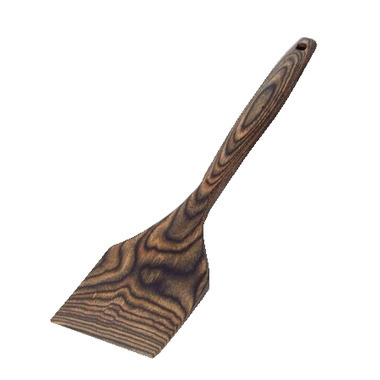 This Island Bamboo Black Paka Wood Spatula is an earth friendly choice for your kitchen. I really like the wood idea but for me this is too heavy and ridgid. It is hard to scrape around the edges of the pan to clean up and impossible to lift any thing like and egg or pancake from the surface because it is too thick. My husband is going to try and round off the edges for better cleaning but it still won't work as a spatula. For me this was a complete waste of money. I recently replaced all of our plastic cooking utensils with these ones from Island Bamboo and I can't recommend them enough! They're gorgeous, wonderful to cook with and clean up well! Love this spatula, I use it with my ceramic pans, not only is it beautiful but it works great and cleans up easily. Very solid and feels great in the hand.